It’s mid May, so put away the soil thermometer. When you get the chance to seed, then seed. 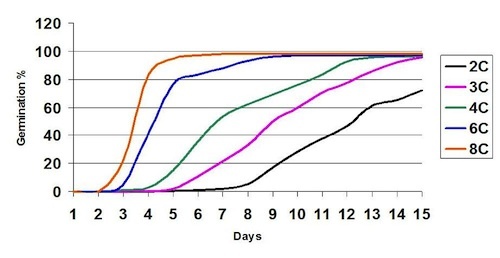 Seeding into warmer (8-10°C) soils will improve seed survival and have more seed emerging at the same time (as shown in the graph) but this needs to be balanced against the benefits of early seeding. To improve seed survival and speed of emergence in cooler soils, seed shallow and use seed-placed phosphate. Limit all other seed-placed fertilizer.